Cut-and-paste is a marketer’s worst nightmare and the very cradle of “dark media,” or digital content sharing that can’t be tracked using traditional methods. For example, if friends are making travel plans in a group chat via text, Mike might cut and paste a link to ABC Tropical Resort into the group text. The rest of his friends will follow the link and just like that, ABC Tropical Resort’s marketing director is unable to track the origin of these new clicks. 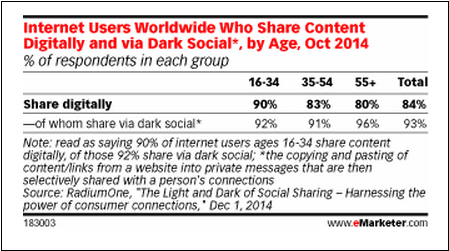 An overage of 93 percent of internet users share content via dark media. What does this mean for the marketer? The ABC Tropical Resort marketing director won’t be able to accurately measure the true reach and engagement of her digital marketing campaign – and neither will you. Embrace dark media. Hey, if you can’t beat ’em, join ’em. Shed light on dark media by highlighting this method in your communications and encourage sharing among your audience. Continue focusing on your email strategy. Ensure there’s a subscription link so when people forward your email, their interested peers may also subscribe. Encourage the engagement of your choice by creating a contest and directing your audience to take certain actions (i.e. share your website using a specific code across their social media channels).